He was born in Syracuse, NY, to his late parents, Florence (Cory) and William Lamphere on Jan. 23, 1950. He was a graduate of Mexico High School. Skip was a self-employed carpenter. He also worked for Pullens Plumbing & Heating, and Charles Heating and Plumbing. He was a member of First Baptist Church in Fernwood. 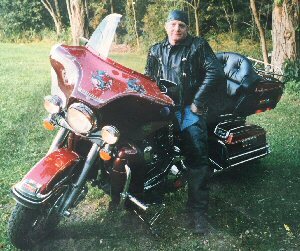 Skip was a Harley Davidson rider, belonging to H.O.G. group; the ABATES; and was an avid hunter. of Parish; several grand and great-grandchildren; a sister, Betty Blum of Iowa; a brother, Charles Lamphere of Rome, NY; a cousin, Paul Mercier; many nieces and nephews. Calling hours will be held on Saturday Aug. 11, from 10 a.m.
until noon with a noon funeral service all in First Baptist Church, Fernwood, 146 County Route 41A, Pulaski, NY 13142. Contributions in Skip’s memory to: Make a Wish Foundation.